FUN FACT: Pop a bottle! 2010 marks the 25th anniversary of Toshiba&apos;s laptop division. WHY COMPLEX IS CO-SIGNING: Damn, it&apos;s a good time to be in the market for a portable computer. You can go for a netbook, though they&apos;re a bit underpowered and their small screen can be a hindrance; you can rock with a tablet, though they don&apos;t really replicate the computing experience; and there are ultra-portables, which combine the best of both worlds (power and portability) but carry a hefty price. 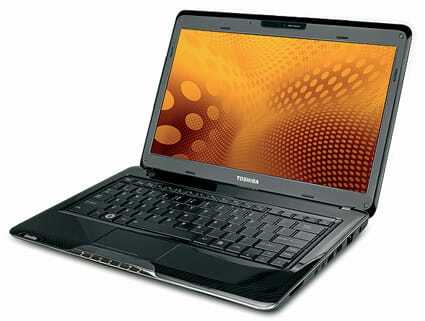 Or, you can opt for an ultra-low-voltage(ULV) laptop like Toshiba&apos;s Satellite T135. ULVs are bigger than netbooks, and offer a much-needed boost in performance and real estate. Oh yeah, did we mention they fall well under a stack? • CHOICE OF PROCESSORS. Toshiba gives you the choice between three processors: a 1.3-GHz Intel Pentium, a AMD Athlon Neo Processor MV-40, or a AMD Athlon Neo X2 Dual-Core Processor, which is what our test model came with. Although low-powered, they proved more than capable of handling our daily tasks. Applications, web pages, and images DL&apos;ed off cameras all loaded quickly. • COOL DESIGN. The defining factor in small laptops is the design and Toshiba holds its own with a slim (less than an inch at its thinnest point), well-designed package. Surprisingly, the fake carbon-fiber weave on our model worked well and didn&apos;t come off cheesy. • GREAT CONNECTIVITY. It comes with three USB 2.0 ports (more than a MacBook), a microSD card slot, a VGA out port, and, coolest of all, an HDMI port for watching videos on a HDTV. • TOSHIBA LETS WINDOWS BE WINDOWS. Unlike a lot of other computer makers, Toshiba doesn&apos;t slather its own software all over Windows, making tasks like connecting to the Internet that much easier. We wish other companies would do the same. • GOOD VISUALS. The 13" screen was nice and bright with passable graphics, thanks to the ATI® Radeon HD 3200 graphics card. It&apos;s not a gaming computer and isn&apos;t meant to crunch graphic-intensive projects, but it holds its own considering the price. • BUILT TO LAST. We never really tested it, as we didn&apos;t want to drop it and damage it, but the T135 comes with a Hard Drive Impact Sensor which is supposed to hold the hard drive heads in place when it feels it&apos;s about to be dropped. Does it work? We&apos;re not too sure, but it makes us feel secure. • LONG BATTERY LIFE. Depending on how heavy it&apos;s used, the battery can almost last you a full work day. We had it running for a little under eight hours. • UNRESPONSIVE TRACKPAD.The single trackpad key was unresponsive at times, making it difficult to right-click. We ended up just clicking through the trackpad itself. Also, you can't scroll using the track pad. • WEAK SPEAKERS. You better pack your headphones as the speakers aren't too powerful. Then again, we can't imagine why you would want to use this as a boombox. • WEIGHT. A little heavier than its competition. FINAL SAY: Priced just above a netbook, Toshiba&apos;s T135 delivers the same portability and battery life while offering much better performance.